Whilst here in LA, one thing I've really been enjoying is a nice salad. No underripe tomatoes and watery cucumber slices here — there are so many types to choose from, all combining different textures, colours and flavours. My favourite "salad" is a Buddha bowl type, made up of sautéed or roasted vegetables with plenty of herbs and a zesty dressing, plenty of extra virgin olive oil, sea salt and spices, served warm or ambient rather than fridge-cold. This is, from an Ayurvedic point of view, much better for digestion (which is EVERYTHING, as nutrition science is beginning to understand). 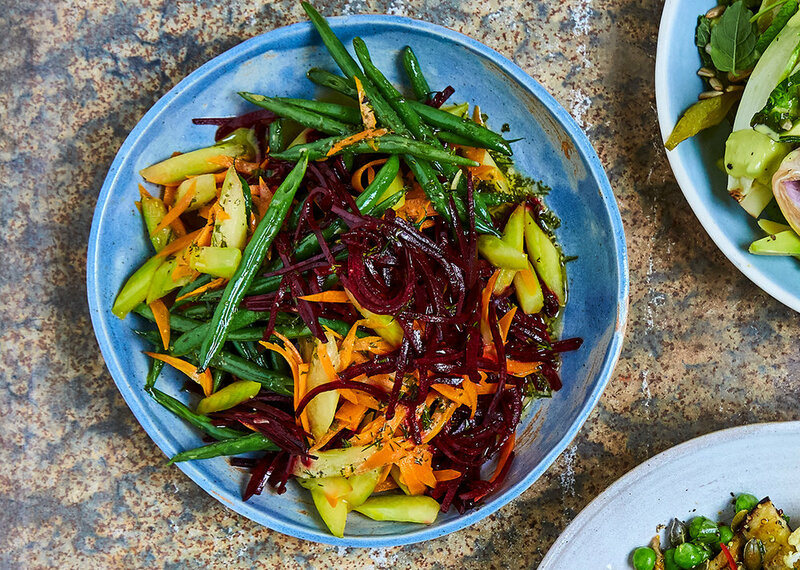 My sautéed cucumber, green beans, beetroot and carrot salad bowl is especially good for calming Vata energy — the Dosha type that’s easily aggravated by rough, raw or cold foods. Even if you’re more Pitta or Kapha (if you don't know your mind-body type yet, take my short quiz here) you would do well pacifying Vata energy when you’re run down, wired, anxious or travelling (basically all of modern life) to keep your energy as steady as possible. Also, check out the Pitta and Kapha salads on pages 144 and 145 of East by West. I love cucumber, but with its bitter seeds, hard-to-digest skin and cooling nature, it’s not a Vata favourite — until, that is, it’s peeled and lightly fried to bring out more of that delicious sweetness. Cucumber is a great example of the way preparation changes the properties of foods, and of how cooking can give everything a little pre-digesting magic fairy dust before it hits your tummy. The rest of the ingredients are very Vata-loving, too. For a more filling meal, top with shredded chicken or toss with cooked basmati rice. In a large frying pan, melt the ghee and gently sauté the garlic for 1 minute. Add the green beans and stir for 3-4 minutes, being careful not to burn the garlic. Add the carrots and cucumber and continue sautéing for another 5 minutes. Set aside. In the same pan, sauté the beetroot for 3-5 minutes. To make the dressing, add the vinegar and salt to a small bowl and whisk until the salt dissolves. Add the dill and mustard and whisk to combine. Slowly drizzle in the olive oil, whisking continuously, until the dressing is smooth and emulsified. In two serving bowls, layer the beetroot and the cucumber and green bean mixture. Serve warm or at room temperature, drizzled with the dressing.